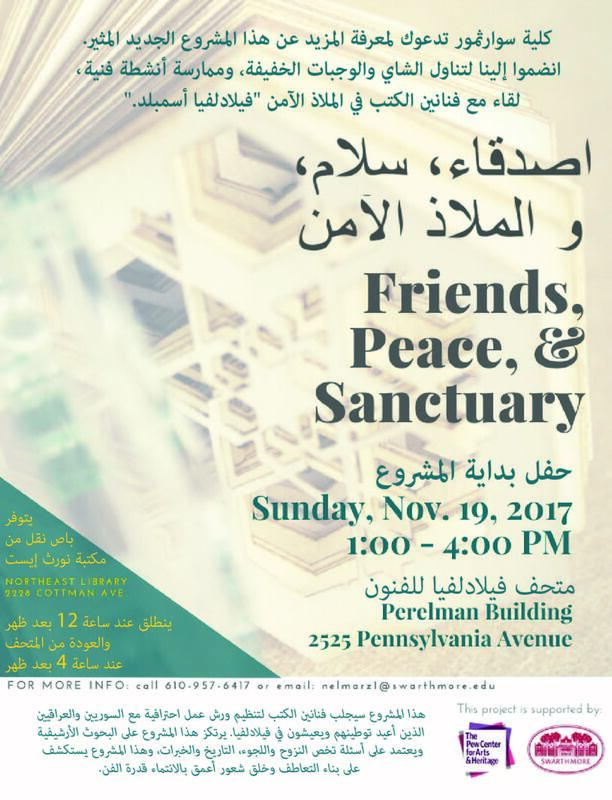 Our friends in the Swarthmore College Library and the Lang Center for Civic and Social Responsibility invite you to join them on Sunday, Nov. 19th from 1:00-4:00 at the Perelman Building at the Philadelphia Museum of Art to learn more about Swarthmore College’s Friends, Peace, and Sanctuary project. At the event, you can meet the book artists working on the project, connect with potential collaborators, and celebrate the project’s launch with tea, snacks, and art-making. Swarthmore College’s Friends, Peace, and Sanctuary will bring together book artists and Syrian and Iraqi individuals who have resettled to Philadelphia. Driven by questions about displacement and refuge, history and experience, the project explores art’s capacity to build empathy and create a deeper sense of belonging. Working in partnership with the immigrant and refugee service organization Nationalities Service Center, Swarthmore will invite a group of collaborators to work with renowned book artists and participate in multi-day workshops designed to provide access to new creative tools, and to explore various aspects of visual storytelling, artistic expression, and craft. Swarthmore’s library collections—including the Friends Historical Library and the “Peace Collection,” the largest archive of peace-related material in the U.S.—will be made available to book artists to inform their commissioned works, and to collaborators, with materials translated into Arabic. Both the workshop collaborators and the book artists will create books that highlight the relationship between historical and contemporary stories of displacement. The project will culminate in a series of programs, exhibitions, and an exhibition catalogue that will focus on how archival, academic, and community knowledges can come together to address contemporary issues. Friends, Peace, and Sanctuary has been supported by The Pew Center for Arts & Heritage and is a collaboration between Swarthmore Libraries and the Lang Center for Civic and Social Responsibility. The Human Library launches this *Friday November 1 from 5:30-7:30 PM in Upper Tarble*! A catered dinner will be provided for all participants. If you have a story you’d like to share, sign up at http://www.swarthmorehumanlibrary.org/become-a-book The organizers would love to hear from you! 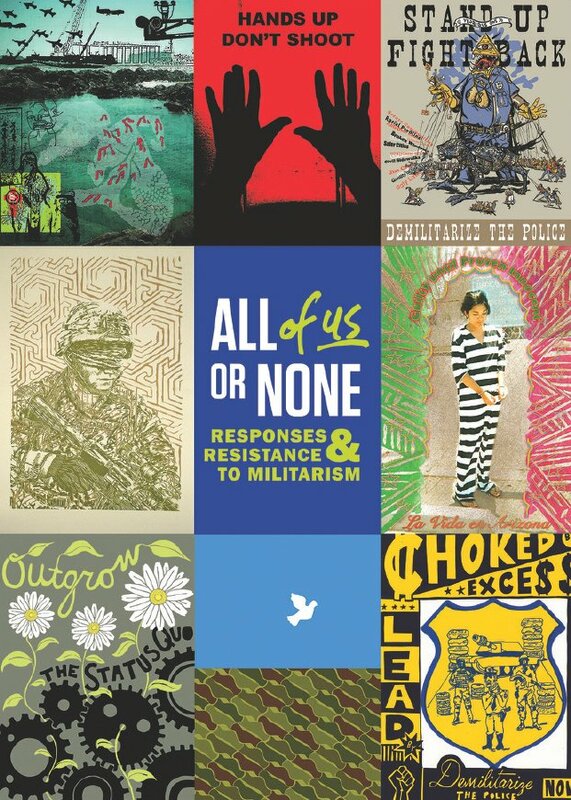 Across the globe, militarism directly impacts all of our lives. 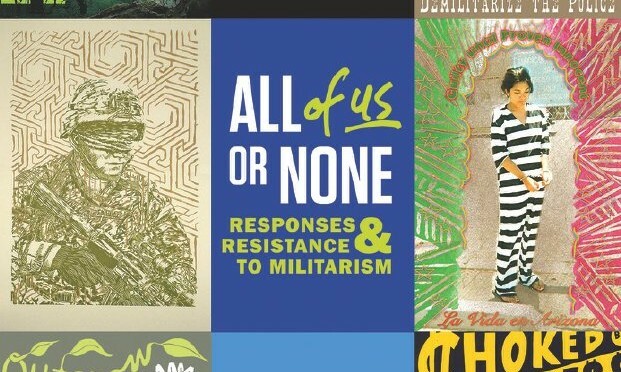 The American Friends Service Committee’s new traveling exhibition, All of Us or None, examines the effects of militarism at both the foreign and domestic policy levels. It also highlights alternatives and positive nonviolent solutions. Download a flyer and a postcard. Sponsored by Peace & Conflict Studies and Swarthmore College Libraries. Tweet your reactions to #HumanizeNotMilitarize.